When the pancreas becomes inflamed or irritated a condition called pancreatitis is usually diagnosed. This condition can have many causes such as excessive alcohol consumption, gall stones, a blocked pancreatic duct, hypocalcaemia, or hyperlipidemia, and develops in two forms- acute or chronic. The type of pancreatitis that you are suffering from will determine the course of treatment that you will need. The main goals of acute pancreatitis treatment are pain management, restored fluid balance, and pancreas healing. For pain management many individuals who are suffering from acute pancreatitis are given prescription strength pain medications. These medications work to dull, or relieve the pain associated with pancreas inflammation and allow the patient to relax and rest easier for faster healing. In most cases these pain medications are given orally, however in very severe instances these medications can be given through an IV. The most common treatment geared towards balancing body fluids in intravenous transfusion. During IV treatment fluids- ones that contain the proper mix of water, electrolytes, glucose, and nutrients- are administered through tubing that is attached to a needle in the patient's arm. Since the consumption of liquids or foods through the stomach will increase the activity of the pancreas this method is also chosen as an added way to reduce the stress on the pancreas as it heals. Another way to reduce the activity required by the pancreas and allow it relax and heal is through diet changes and modifications. During episodes of acute pancreatitis doctors usually prescribe a diet low in fat and protein for the patient. The consumption of smaller meals is also recommended. Just as it is in the treatment for acute pancreatitis, pain management is a common goal of chronic pancreatitis treatment. However, since the pain associated with this type of the condition is ongoing mediation choices are limited. 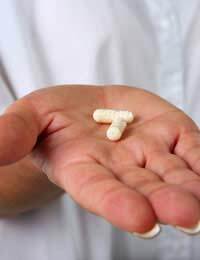 The stronger pain medications that are used in the treatment of acute pancreatitis can be addicting when used long-term, and the medications can also become ineffective as the body becomes accustomed to their presence. Pain medication choices for chronic pancreatitis are usually weaker in strength and doctors and pharmacies carefully monitor dosages. Another complication of chronic pancreatistis that warrants treatment is malabsorption. Since many individuals who are suffering with this condition also experience a loss of appetite. Another cause of malabsortion is the ineffectiveness of pancreatic enzymes. During times of inflammation the pancreas may not produce adequate amounts of enzyme to properly breakdown food so nutrients are allowed to pass through the digestive system unabsorbed. The main treatment for malabsorption is intravenous feeding or a feeding tube. The most common causes of chronic pancreatitis are gallstones and alcoholism. In order to cure the pancreatitis doctors need to treat these causes first. In the case of gallstones, doctors can perform a procedure to remove the gall stones, or in extreme cases the gallbladder. When alcoholism is to blame the doctor's first course of action is to help the patient reduce their alcohol consumption. For most patients this will mean a hospital stay while they attend an alcohol abuse/chemical dependency treatment program.